Robyn Vilate: how we wore: week 4 & winner of mttheory sunglasses! how we wore: week 4 & winner of mttheory sunglasses! da da da da! layers! my favorite part about fall and cool weather! so when this time of year rolls around i bust out sweaters, jackets and all the goods! but after getting this new sweater in st. g, i was excited to get home and actually wear it! also, i'm not sure if you've noticed, but i don't think these booties will be thrown to the back of the closet anytime soon. i only wear them every other post. make sure to check out leigh anne and lisa's posts on how they wore! ps. excuse the photos- i got back late last night from tripping and had to practically take these in the dark! and that was on top of having to run out into the street when all our neighbors decided to park on the street- procrastination strikes again! also- congratulations to britley clarke- the winner of the mttheory sunglasses! email me @ robynstewart4@gmail.com to claim the glasses! 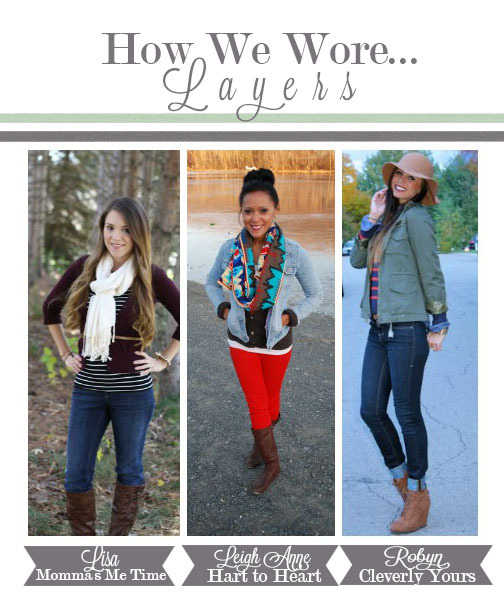 Love the layers, and those boots! i love your olive jacket! !